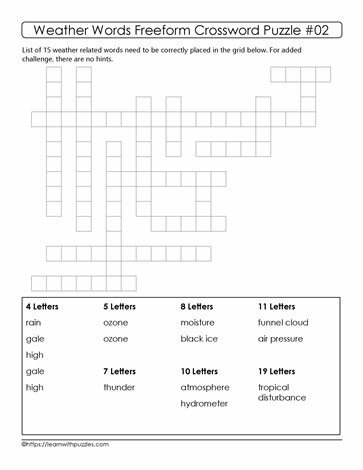 This environmental freeform crossword puzzle is sure to keep students on their toes with trying to complete the grid by putting the weather related words in the blank boxes. There are no hints, so one of the best strategies to help solve the puzzle is to find categories of words with the least number of words. In this puzzle, 'tropical disturbance' contains 19 letters and is easily located in the grid because there is only one word of that length. Next, locate words that share common letters at the 'crossword' points, and then place that word in the grid. Continue until the puzzle is solved. Puzzle suitable for homeschooling program studying weather, global warming and environmental science.